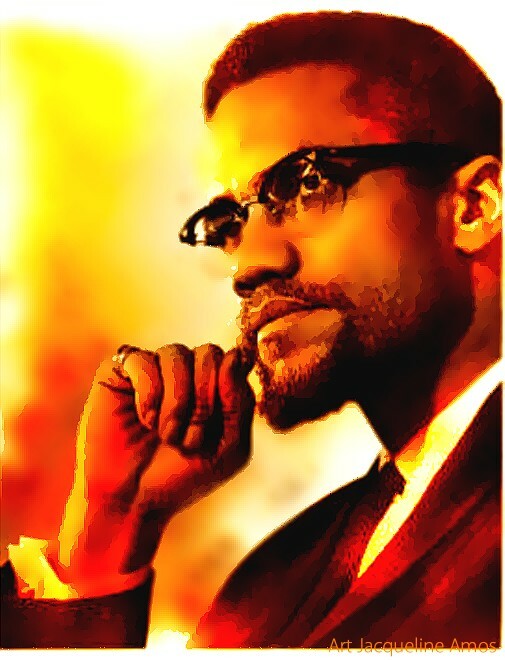 A minister of the field, as many who came after him, the resurrection continue to come when man walks in the light of God, what is a man if he cannot dye for the almighty words call law, a coward dies a thousand time but a brave man dies once, Malik Shabazz stood as a man, and died as a man, every man knows the penalty of death, to rise again in life the almighty God, Allah, the paradise of prophets. Malik Shabazz the warrior of warriors, the soul that walk through the fire until the light appeared, and God said in his ear, deliver my people from Egypt bring them home, and the d evil became angered and filtered the minds of those, who oppose the teachings of God, and then there was the burning bullet, love your woman but don’t allow her to dictate your soul in what it takes to be a man, respect the black king, but take care your business and protect your roots, are your business will take care of you. but never the wisdom to apply. of the beholder I pledge to self . The abomination of earth bows to a different high. has no strength of its own. Circles of truth sealed within a box with a rusted key. genocide dust, zombies that walk upon the earth. Sleep the sister to death. Human defeat to self. Passages clutter with suicidal infiltrated within the soul. power of the sun, first rays of the light. a culture, country, a destruction of mans own right hand. Genocide of thy Accessorial tree. from the death of the root of the tree. Civilizations hurdle within the myth of rotten death. me my self and the mind refuses to link. of the open womb, designated within the darkness of the sea’s. that lives within. Sustain, it no longer exists.